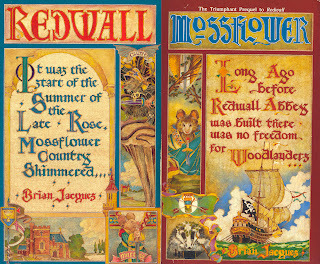 Brian Jaques, author of the beloved Redwall series, passed away on February 5th, 2011. He was born in Liverpool, England, 1939. (These are the covers to the books I have. In 5th grade I wrote a short story for a contest the school library was hosting. My story was about a time machine, that's all I can remember. I won a free lunch out with the head librarian and as a surprise after lunch she took me to an independent bookstore so I could pick out one book that she would pay for. I chose Mossflower by Brian Jaques. Mossflower (pub. 1988) is the prequel to the first book in the Redwall series, Redwall (pub. 1986). At the time, I didn't know that it was part of a series, but because it was a prequel it all worked out. I began collecting the series after that. The characters were all animals–I liked animals. 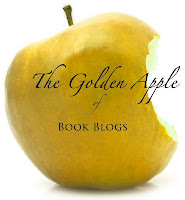 It was medieval-ish fantasy–I liked medieval-ish fantasy. The animals all had clothes and weapons; this is where I first learned about adders, stoats, and pikes (the weapon not the fish). All in all it was a fantastic series, right up my alley. In total the Redwall series is a 22 (23 including a sub-story) collection with numerous associated publications, and even a TV series. I forget how far I read, perhaps eight or nine books. Instead of finishing the series, I simply wanted a cookbook. Those forest animals sure knew how to party. 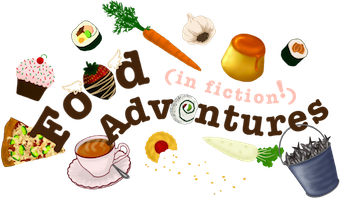 Within every book was a seasonal festival or feast featuring the biggest spread you could imagine; deeper'n'ever pies, honeyed oat scones, sugared whatnot's, and various cordials. I drooled and dreamed. There wasn't a cookbook available at that time; I was very disappointed (and hungry). It had to happen eventually though, and it did–I just found out! 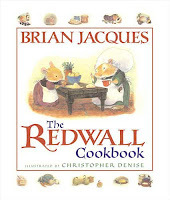 In 2005 The Redwall Cookbook (shown below, right) was published. It's definitely going on The List (you know, the wishes kind). Brian Jaques began writing the Redwall stories for a school of blind children in Liverpool. He was a truck driver that delivered the school's milk. 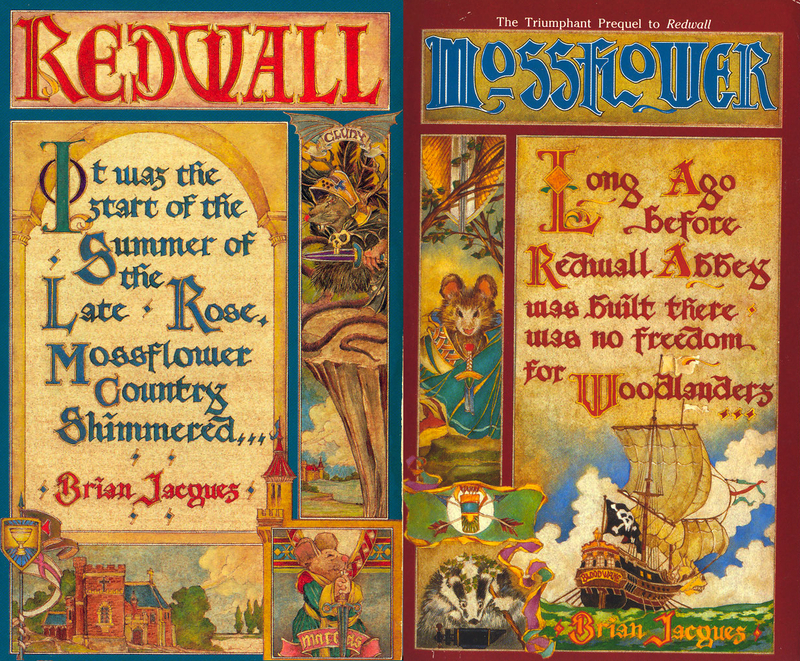 A childhood English teacher of Mr. Jaques sent one of the Redwall manuscripts to a publisher. The rest is history. As I already mentioned a Redwall TV series was made, three seasons in all. It was produced by good ole' Nelvana starting in 1999. A graphic novel version of the Redwall book was published in 2007. Also in 2007, a music CD containing the songs from the books was produced with vocals performed by Billy Maher. Even a Redwall musical premiered in 1998. This extremely long series was not the only project of Mr. Jaques though (but the one that I am most familiar with). He also wrote the Castaways of The Flying Duchman trilogy, two tales of Urso Brunov, plus a slew of short stories and things for grown-ups.
" Redwall is where safety and warmth surround you. Food, friends, music and song. Redwall will always welcome you back. " Brian Jaques, I raise my goblet of burdock cordial to you. May your books continue to be loved by many and may you be enjoying your eternal banquet of Watershrimp'n'Hotroot Soup and Rubbadeedubb Pudding. 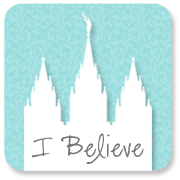 For more information on Brian Jaques go here and here.